Descriptions of each product below the slideshow! 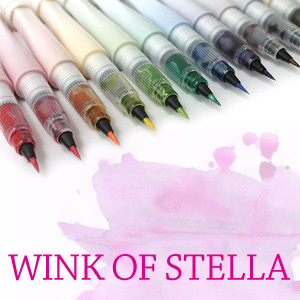 Wink of Stella Brush Markers are archival, waterbased pigment inks infused with glitter dust. This is the perfect marker to add shimmer in a precise manner to any of your paper projects, as well as being added over dry marker ink to add glittering effects. Dyeing has never been easier than with iDye from Jacquard! iDye comes in a dissolvable packet, so there are never any messy powders to handle: simply drop the packet into hot water or toss it in your washer! iDye is a hot water dye for natural fabrics that may be used on the stovetop or in the washing machine. For polyester and nylon, use iDye Poly. iDye Poly is for synthetic fibers such as polyester and nylon. It even works on some plastics! The dye comes in a dissolvable packet, so there are never any messy powders to handle: simply drop the packet in a pot of water, bring it to a boil and add your fabric! iDye Poly may also be used for sublimation printing and to dye the poyester threads that are used to sew commercially manufactured garments. As you can see, the Canson Colorline offers a variety of vibrant colors. A step up from construction paper, Canson Colorline is a heavyweight paper that is acid AND chlorine free. They are great for school projects, scrapbooking, and many other projects. Sold by the sheet. Black Ink Decorative Papers, imported from around the world, are perfect for collages, scrapbooking, book arts, stamping, and many other projects. Come in to see our extensive collection! 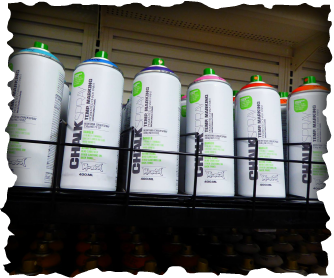 The CHALKSPRAY is an eco-friendly chalk-based pigment spray that is ideal for outdoor temporary marking as well as for indoor studio artwork. Available in 10 powerful color shades that are deep matte and high covering. Montana CHALKSPRAY can be applied on various surfaces such as sidewalks, walls, cardboard or canvas. Depending on weather conditions and climate outdoor marking lasts between several days to several weeks. It fades quickly during extended periods of rain or in high traffic areas. The eco-friendly formula makes it ideal for gardens and landscaping. On non-porous surfaces like glass or metal the pigments can be removed easily. Removal from porous surfaces may take longer. Montana CHALKSPRAY impresses by its feel and look - the typical rough chalk effect. CHALK has very special aesthetics - and Montana CHALKSPRAY brings those aesthetics into a spray that works on almost any surface! Perfect as sidewalk chalk for events, sales actions, advertisement or exhibitions. Depending on weather conditions and climate outdoor marking lasts between several days to several weeks. Montana CHALKSPRAY works also well on canvas, cardboard, walls or other primed grounds due to its great coverage. The CHALKSPRAY will become permanent when sealed with Varnish (when used on a canvas i.e.). It also allows further application by brush, scraper or other tools. For clean and precise lines we recommend to use Montana LeveL caps 3 to 6 (3 and 4 for fine and medium lines, 5 and 6 for wide lines and filling large areas). The most often used search on ZigPosterman.com is “Wide Dry-Erase Marker”. The question is, can the wide Zig Posterman Wet-Wipe marker be used on a dry erase board? The wet-wipe Zig Posterman (along with the Illumigraph) is the most like a dry erase marker. It is however very opaque, unlike a dry erase marker. The mark will be bold and strong on your boards, not transparent and thin. Most often it is removed with water and a damp cloth or sponge. It will not damage your whiteboard and always clean completely off your board. Looking for a wide marker to use on your IdeaPaint walls? The Wet-Wipe is a great option and can be cleaned with a damp cloth or sponge. This will remove the marks even if your surface has slight defects in it. The wet-wipe should not be used outdoors since it will come off in the rain. It does take 1-2 minutes to dry, not as fast as a dry erase marker. The Zig Posterman Wet-Wipe will come off cleaner than dry erase markers from dry erase boards. We have never seen staining on a white board that happens with poor quality dry erase markers. Van Gogh water colours are a transparent paint with intense colours. All colours have the highest degree of lightfastness. Thanks to their purity you can easily mix and wash the colours to the finest of nuances. Lively colours are the result! 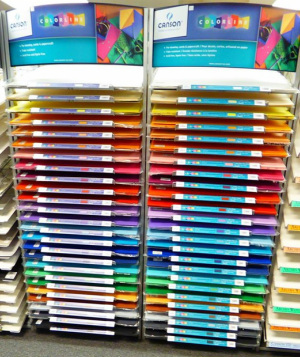 The wide range of 40 colours is available in tubes here at Colorest Art Supplies! 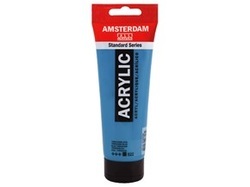 ﻿Amsterdam Standard Series﻿ provides you with everything you need if you want to use acrylic paint. 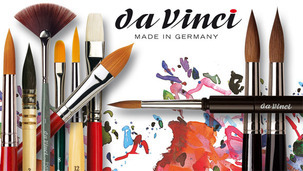 A high-quality acrylic paint in 70 briljant colors. Stop by Colorest Art Supplies to check out all the ﻿NEW﻿ products from Strathmore. We have many different new papers, journals and tiles in stock! "It began in an art studio a decade ago. At the time, our father had been painting for over 40 years, and in the corner of his studio was a graveyard of sorts where old artist palettes were put to rest, none of which proved to be valuable enough for further use. Some of the art palettes were heavy or awkward to hold, causing pain in the hand, thumb, and wrist. Others lacked functionality or were not made well. As is true for many of you, the answer for him involved a trip to the lumber yard, a jig saw, sand paper, and a free afternoon. With that, the design for a new artist palette was created, and the seeds for New Wave were planted. The idea of New Wave grew for years as he invented new palette shapes, around his three point design, for his own use. With our combined efforts a simple idea became reality as new shapes were created and old shapes were refined around his original three point design, with emphasis on comfort, quality and functionality. New Wave was inspired by one individual's dedication to the fine arts for over half a century, and his enthusiasm and zest for the arts resonates in our philosophy. Our portfolio is comprised of the products we offer to you, and our passion is no different than your own. We provide creative products inspired by traditional techniques, made of the finest materials with premier craftsmanship. Welcome to New Wave." Natural Pigments is a limited liability company based in Willits, California. 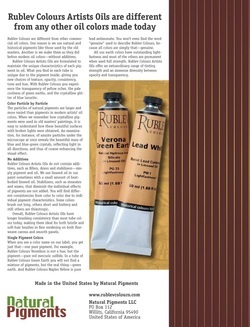 We manufacture and distribute rare and hard-to-find materials for fine artists and decorators. We specialize in supplying artists' materials that were used in historical painting since prehistoric times up to and including the nineteenth century. We constantly search for materials and products of the finest quality so that we can bring them direct to you from the source. To do so, we travel the world to find materials specifically for use by professional artists and decorators. We obtain minerals from mines in Afghanistan, Chile, Russia, Ukraine and Uzbekistan, to name a few places, processing these into natural pigments. We purchase resins, gums and plants from India, Kenya and Malaysia to make natural varnishes and painting mediums. Golden Artist Colors introduces QoR™, a new line of watercolors that offers artists color strength, range and versatility unmatched in the history of watercolors. QoR's exclusive binder gives color greater intensity and clarity, while retaining the best qualities of traditional watercolors. "At Golden Artist Colors we've had the privilege and delight of collaborating with artists to make the highest quality professional Acrylic and Oil colors," said CEO, Mark Golden. "Today that same collaborative process has produced a new, thoroughly modern Watercolor called QoR. Some of the country's most respected watercolor artists were given the opportunity to get a sneak peek at QoR and put it through its paces. We've been delighted with the feedback they've given us and look forward to hearing from more artists once QoR is available in stores this May." 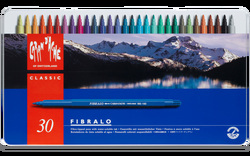 Artists can choose from 83 high-intensity colors, including three Iridescent colors. By utilizing QoR Mediums and Grounds, artists can increase gloss, improve flow or wetting and achieve different textured surfaces, expanding the range and possibilities of watercolor painting. Also available are four sets: Introductory 12 Color Set (010-0), Introductory 6 Color Set (001-0), Introductory 6 – Earth Colors Set (002-0), and an Introductory 6 – High Chroma Set (003-0).